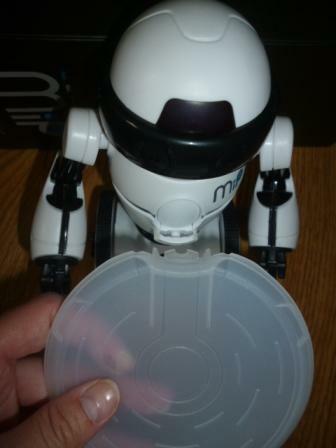 Meet MiP The Self Balancing Toy Robot! If you are looking for a fun toy robot then you’ve come to the right place. 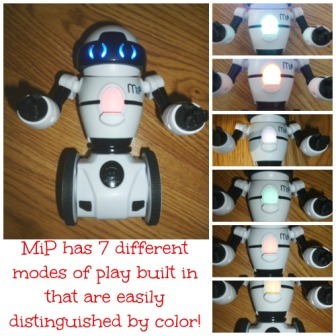 MiP is a self balancing toy robot (which is impressive in itself) that has 7 built in modes of play and has a free app for smart devices that allows you to have even more fun! 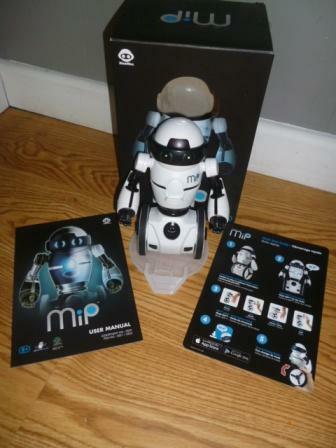 Meet MiP brought to us by the WowWee Company! 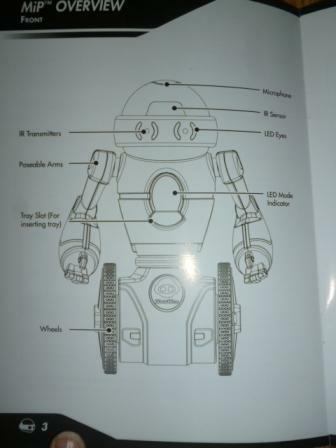 MiP the toy robot comes with a user manual, a quick start guide, a carrying tray, a sticker sheet and a stand. (All pictured above). He is recommended for ages 8 and up. MiP’s arms are pose-able, so you can place those however you’d like to. It has sensors, transmitters, a microphone, and more to make each mode of game play possible. 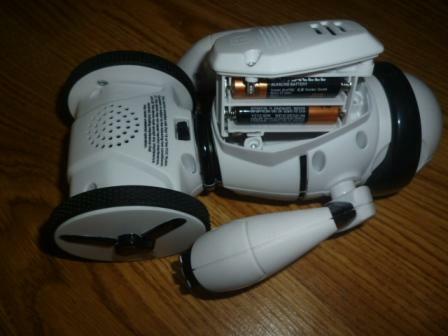 To get started with MiP you need to insert 4 AAA batteries into the back battery compartment. This compartment is secured with 3 screws. Using a small Phillips screw driver you remove the cover and insert your batteries, then re-screw on the cover. With just a simple switch to “on” located on the back of the toy robot you are ready to play! MiP has his own set of vocabulary too! Once MiP the toy robot is switched “on” it is ready to self balance. To help the toy robot balance you hold him upright and place your hand in front of his face. It will sense your hand and once you feel traction in the wheels it will balance itself! The first time I balanced MiP I was impressed! When MiP starts up, he automatically goes to “default mode” which is indicated by a blue light on his belly. In this mode he detects hand gestures and responds to claps & shakes. Just by simply placing your hand in front of the IR sensor (located above MiP’s eyes), you can move your hand backwards, forwards, left to right, and even make MiP stop via hand command! I snapped the picture below just before he rolled over the wood piece separating the dining and living room. He works best on smooth hard surfaces, but more than once he found his way to one of our carpeted rooms and managed to stay balanced! “Blue default mode” is just one of MiP’s 7 built in modes. It is easy to change “modes” by rotating either one of his wheels. The modes are set up in a specific order that is listed in the owners manual, so you can twist clockwise or counter clockwise to reach the mode you want. Pink-Stack mode-attach the stacking tray to MiP. Balance MiP and a countdown timer starts. You have just a few seconds to stack as many or as few items you want onto the tray. If it can balance correctly, it will give you more time for you to stack. When the timer runs out MiP will spin in a fast circle tossing all the stacked items off the tray. You get to see how many you can stack before the timer runs out! White- Cage mode-See if MiP can escape you! Place your hand in front of his eyes to block his path. This will cause him to find another path, he will move faster as the game goes on, so it gets trickier! MiP will make a victory sound if he is able to escape! Clap 2 times to restart the game! Yellow-Roam mode-MiP will roam around and explore his environment for up to 3 minutes detecting obstacles in it’s path. Turquoise-Dance mode-this is our family’s favorite mode. MiP has some moves, plays music, and we can’t all help but want to dance with him! Here is a video of us playing with MiP in dance mode! Orange-Track mode-Put your hand in front of MiP until he beeps, this means he is tracking your hand and will follow it! The modes highlighted above are JUST the built in game play, there is even MORE that you can do with the FREE app that you can download from the Google Play store or App Store! To see if your device is compatible CLICK HERE. I could list all the fun details that the app can do, but this video does such a great job showing the features! 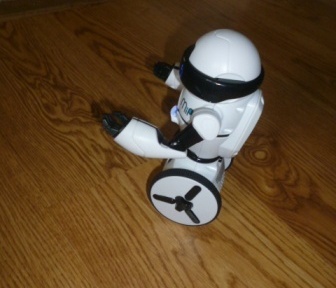 This fun self balancing toy robot has been a blast to play with, and not just for the kids, I’ve had a fun time too! You can purchase MiP online for $99.99 and choose between black or white. You can also purchase him at Best Buy. 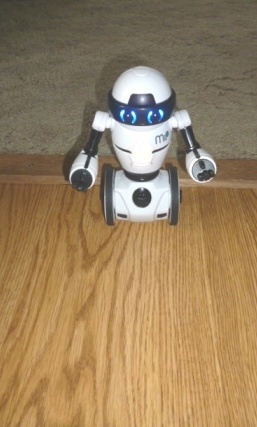 What do you think your kids would enjoy most about MiP the self balancing toy robot? Disclosure: I received the product mentioned above to help me gain an opinion to share with you. Regardless of our arrangement the views expressed above are not swayed and are 100% mine. What are the stickers for? THIS IS AWESOME! AND I LOVE THE NAME MiP. IT’S SO ADORABLE !!!!!!!!!!!!!!!!!!!!!!!!!!!!!!!!!!!!!!!!!!!!!!!!!!!!!!!!!!!!!!!!!!!!!!!!!!!!!!!!!!!!!!!!!!!!!!!!!!!!!!!!!!!!!!!!!!!!!!!!!!!!!!!!!!!!!!!!!!!!!!!!!!!!!!!!!!!!!!!!!!!!!!!!!!!!!!!!!!!!!!!!!!!!!!!!!!!!!!!!!!!!!!!!!!!!!!!!!!!!!!!!!!!!!!!!!!!!!!!!!!!!!!!!!!!!!!!!!!!!!!!!!!!!!!!!!!!!!!!!!!!!!!!!!!!!!!!!!!!!!!!!!!!!!!!!!!!!!!!!!!!!!!!!!!!!!!!!!!!!!!!!!!!!!!!!!!!!!!!!!!!!!!!!!!!!!!!!!!!!!!!!!!!!!!!!!!!!!!!!!!!!!!!!!!!!!!!!!!!!!!!!!!!!!!!!!!!!!!!!!!!!!!!!!!!!!!!!!!!!!!!!!!!!!!!!!!! !